Once again, like last year, I spent a whole day at the racetrack, in Sacramento, at the California State Fair. Came home a little sunburned--it was a hot day, and the cool of the indoor area was a very welcome respite between the races. There were nine races on the card, with the first at 1.45 p.m. The first race was a quarter horse race. Those guys are so fast! 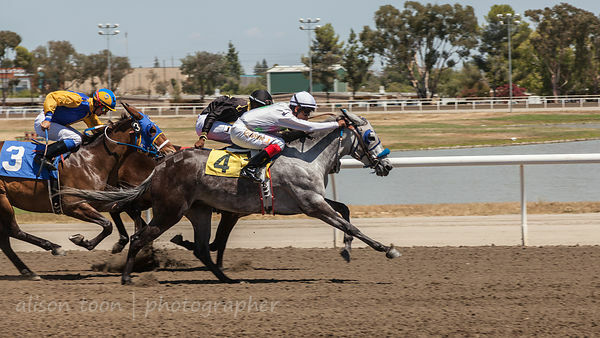 Quarter horses are an American breed, and they are the sprinters of the horseracing world. 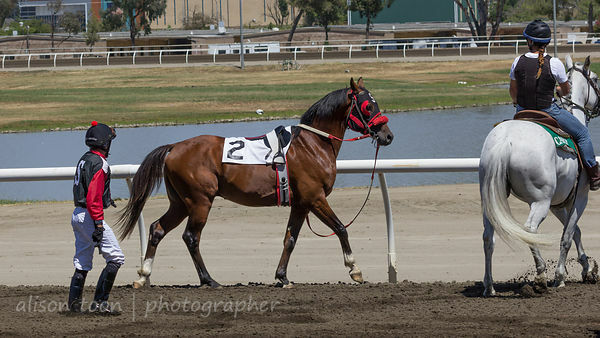 Quite logical naming: a quarter horse runs the quarter mile! And did you know that you or your company can sponsor a race at the State Fair? You too can be in the winner's circle! Have your name in the program and a special box for you and your guests, all day of the race. Check out all the info here. The second race was... mules. Yes, mules. Last year, we arrived just before this race, and I hadn't had a chance to read the program. I was expecting thoroughbreds and thinking, that horse over there looks like a donkey... wait, that one does too, and that one... But no, they are not horses, they are not donkeys, they are the best of both: they are mules, and they can run. The winner of the mule race was Senorita. Everyone kept out of her way. She has a reputation for being a little feisty, a little... mulish... in the winner's circle. But what a run! Race three was special. As the horses were parading in front of the stand, before the race began, number 2, WMA Red Pepper unseated his jockey, and decided to race the course by himself, before they were anywhere near under starter's orders. 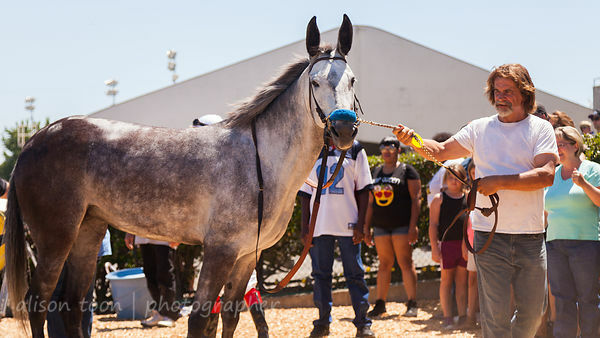 The three-year-old bay colt zoomed off around the track, leaving jockey Jesus Velasquez frustrated, on his feet on the dirt racetrack. But guess who was way out in front at the start of the race! And look who won! Yes, it was WMA Red Pepper, living up to his name, and bringing in the prize for trainer and owner Helen Shelley. 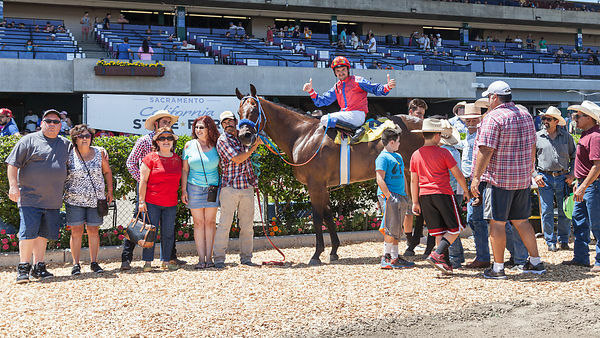 Big smile on jockey Jesus' face at the end of the race, and the crowd went wild! 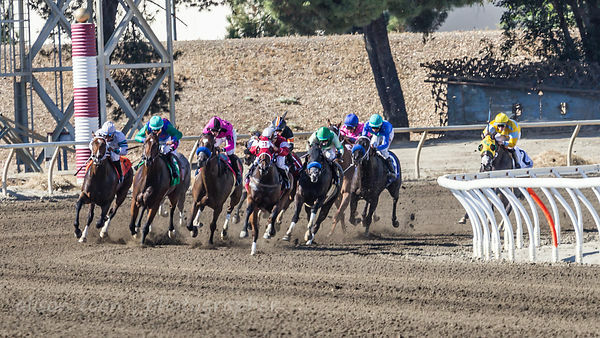 Race eight, the California Governor's Cup, had the biggest field of the day, with twelve horses listed to begin the race. 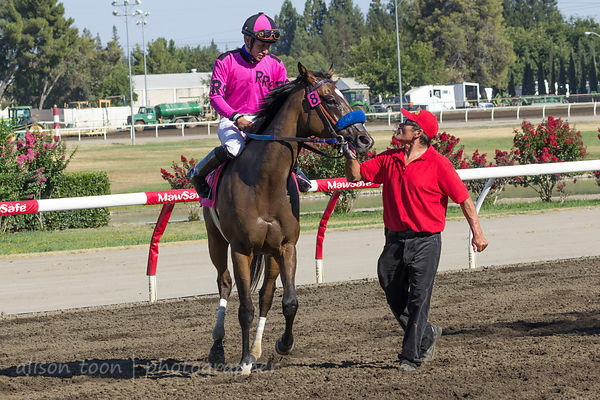 Alliford Bay, winner of the 2017 California Governor's cup, ridden by jockey Irving Orozco, trained by Blaine Wright and owned by Peter Redekop B.C. Ltd.
More racing today, and next weekend--Thursday to Sunday--too! It's included in your entry to the California State Fair!